Pretty solid formula for a place you’d like to hang out, all things considered. You can only think of one minor improvement. More pizza. More gin. More nice-looking people. 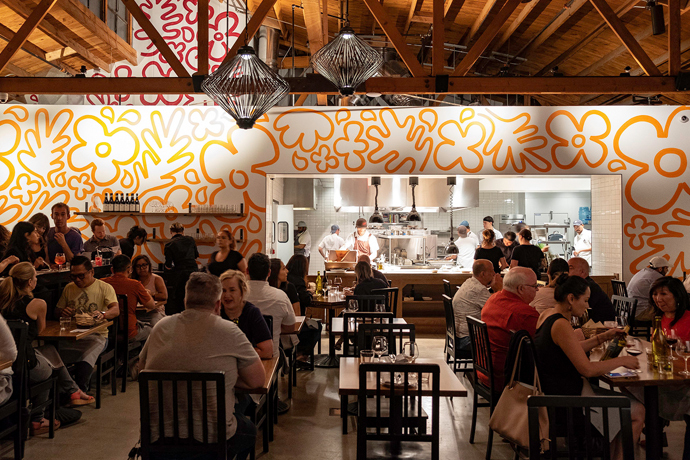 It’s the new outpost of Terroni that you’re picturing—it’s bigger than the original LA spot, it’s pretty damn beautiful, and it’s way Downtown-ier. Oh, and it opens... today. Basically, if the Terroni on Beverly were merely an unformed ball of dough, this is what would happen after it was kneaded and stretched in every direction. Think 30-foot ceilings, a striking bar made of leather and zinc, an oyster station and—oh, sure, why not—a racetrack on the ceiling. Nope: your buffalo pizza still isn’t cut. Yes: your Negroni remains Negroni-ish. It’s all still got that molto-Italiano-(by-way-of-Toronto) thing happening, where it feels like your watch is running fast... but really you’ve just passed an unreasonable amount of time eating pizza and laughing and being all Euro and lackadaisical. Great word. Lackadaisical. But if you demand something more, something that seems to resemble a spaghetti frittata—good news. For the first time, a Terroni brunch menu is a thing. There’s never a bad time for a brunch menu to become a thing.